John Travolta was born and raised in Englewood, New Jersey on February 18, 1954. He was born to Salvatore Travolta and Helen Cecilia as the youngest of six children. His family has a mixture of both Italian and Irish ancestry, his father being a second generation Italian American and his mother an Irish American. His family was Roman Catholic and the community in which he grew was also an Irish-American neighborhood. His father was a tire salesman while his mother was an actress and singer. John Joseph Travolta is best known as an actor; however, he is also a dancer and singer. After leaving high school, Travolta relocated to New York City where he landed a role in the touring company of the musical ‘Grease’ and on Broadway in ‘Over Here!’ There he would sing the Sherman Brothers song ‘Dream Drummin’, shortly after he moved to Los Angeles in hope of gaining more exposure for his acting career. There he played the role of a messenger on the CBS soap opera The Edge of Night and The Secret Storm. In September 1972 he would play the role of a fall victim in Emergency. Travolta’s first major role would be in a horror film named ‘Carrie’. In this film he played Billy Nolan, a character that was a bully who was trying to play a prank. His acting career started to bloom when he appeared on a television series called ‘Welcome Back, Kotter’ which aired from 1975 – 1979. In this movie he played the lead role as Vinnie Barbino. His sister Ellen also made guest appearances on the show occasionally. While making his way towards becoming a renowned actor, Travolta also ventured into the music arena by releasing a single called ‘Let her In’ which peaked at number 10 on the Billboard Hot 100 chart. In 1977 Travolta would play one of his most revered roles in the movie Saturday Night Fever as Tony Manero and in 1978 he performed in the movie Grease as Danny Zuko. These films were among the most commercially successful pictures of that decade and landed hugely for Travolta, those movies ultimately propelled him into international stardom. His performance in Saturday Night Fever earned him an Academy Award Nomination for Best Actor and he also became one of the youngest performers ever to be nominated for the Best Actor Oscar. He also performed several songs on the Grease soundtrack album which sold more than 10 million copies. His career would revived in 1994 and his name would be re entered back onto the A-list of actors. This time he performed in the hit film directed by Quentin Tarantino, Pulp Fiction as Vincent Vega. For this performance he would receive an Academy Award Nomination and many offers for movie roles. Other notable movies in which Travolta would play a role in afterwards are Get Shorty in 1995, Face-Off in 1997, A Civil Action and Primary Colors in 1998 and The General’s Daughter in 1999. John Travolta’s most recent projects include Bolt (2008) which is an animated movie where he is featured as the lead voice role and ‘The Talking of Pelham 123’ (2009) alongside Denzil Washington. John Travolta owns a $4.9 million estate in the Jumbolair subdivision in Ocala, Florida. It is located on Greystone Airport which has its own runway and taxiway that leads straight to his front door. He is also a certified pilot and owns five aircrafts including an ex-Australian Boeing 707-138 airliner. In honor of his children, the plane was named Jett clipper Ella. In 1975, while filming the movie ‘The Devil’s Rain’ in Durango, Mexico, Travolta began reading a book named Dianetics and has since been a practitioner of Scientology. Earlier in his career while filming The Boy in the Plastic Bubble, Travolta was involved with actress Diana Hyland but in 1977 she died from breast cancer. 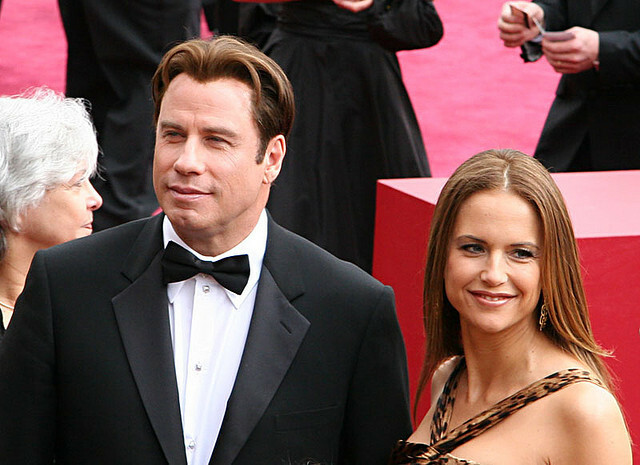 In 1991, Travolta married Kelly Preston who is also an actor and had two children together, a boy, Jett and a girl Ella Bleu. On January 2nd of 2009, while Travolta’s family was on a holiday trip in the Bahamas, their son Jett died from a seizure. In the past Jett is reported to have suffered from Kawasaki disease and had a history of seizures. Travolta later testified that his son suffered from autism and experienced regular seizures due to an extortion plot against his family. It is reported that some persons refused to transport documents signed by John Travolta when paramedics arrived to treat Jett. This led to three (3) persons being arrested in connection with the extortion plot.